We went on our family vacation last week. My sister had made arrangements with a friend of hers to let us borrow their condo in Lake Tahoe. We had never been, and it was a wonderful treat ~ the perfect way to celebrate our 25th anniversary. The drive north was several hours, but it’s a lovely drive. 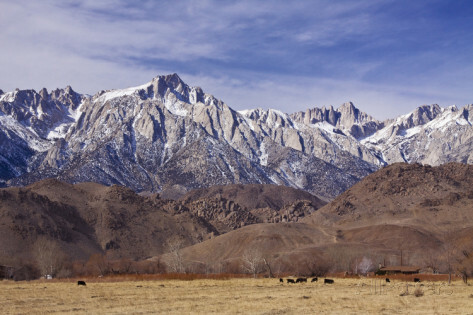 Through little towns like Lone Pine, Big Pine and Bishop, driving along in the shadow of Mount Whitney. I can’t help but think, as we travel through remote, historic places of those who went before. I picture pioneers and settlers and explorers, traveling through desolate areas, with courage and determination that puts me to shame. Or the Native Americans who made their lives in these areas for generations. Sometimes I know I’m picturing people who were never where I am. Like Lewis and Clark, whose path, I’m sure, took them north of where I was. And Laura Ingalls Wilder, who I’m quite sure was nowhere near this area. Nevertheless, I know they were someplace similar, and that’s enough to get me thinking of them. I took my turn at driving after stopping at a Visitor’s Center near Lone Pine, and because I was the one driving, we made an unscheduled stop. Downright impromptu. It had to be me driving for that to happen, for two reasons: First, the Apple of my Eye doesn’t make a lot of spontaneous, pull-off-at-the-next-off-ramp decisions. And in the past, for the most part there has been no need. The pattern of our vacations is to research the heck out of the area beforehand, so we know all the possibilities. If there’s something educational, historical, aquatic or athletic (we love aquariums and baseball) then we know, and we’ll either plan to stop there, or make the decision that it doesn’t fit into our trip. This vacation we were a little more relaxed. We did only enough research to have a general idea of our destination and the route there. 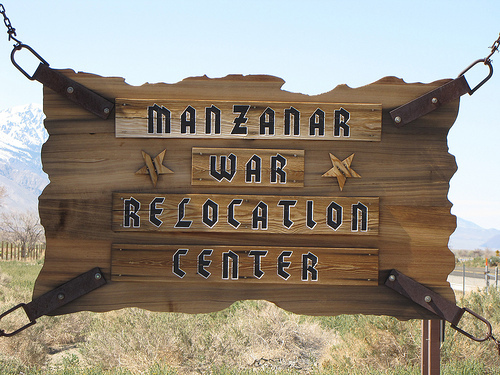 I pulled off the freeway on a whim, when I saw a highway sign that said simply, “Manzanar Next Exit”. Which is the second reason that my hubby wouldn’t have pulled off ~ that word would have meant nothing to him. Understandably. After all, he’s not a history major. Me? I saw something historical and educational, and I rarely miss a chance to teach my kids something new. Both of them had read about Manzanar, and I was excited for it to become real to them. Manzanar, if you too majored in something other than history, was one of several Japanese-American internment camps during World War II. From 1942 to 1945, 110,000 men, women and children were forced to live there because the United States government ~ and in some cases their very neighbors ~ didn’t trust them. I say that without judgment. It was a frightening time, and I believe that those who made the decisions were doing the best they could. But at the same time, the unfairness of it turns my stomach, and the thought of living through that fills me with a mild panic. After all, for an American, there’s no ideal more treasured, more sacred, than freedom. And being told that you have to abandon your home and business and way of life to live in a “gated community,” in a hot, dry, barely habitable plot of land that you can’t leave… well, my heart goes out to them. The children went to school, there was food and they were able to garden, after a fashion. Many of them were employed at Manzanar. They even had dances and celebrations. But they couldn’t leave. In the land of the free, they were not. The driving tour of the Manzanar National Historic Site showed us rock-border outlines of where barracks and other buildings had stood, and there was still one building there as an example. It was not hard at all, to imagine them living there. It was a place of ghosts, you know? And it was a good reminder, as I headed up the freeway on a mission of fun and relaxation, of how blessed I am. I have my husband, my children, and so many others I love. The things I complain about ~ even when I’m just muttering in my mind ~ are nothing to what others have lived through. The Lord loves each and every person He has ever created, and those to come, too. And there’s a lot we can learn from them. Nothing like a history lesson to remind us to be thankful.